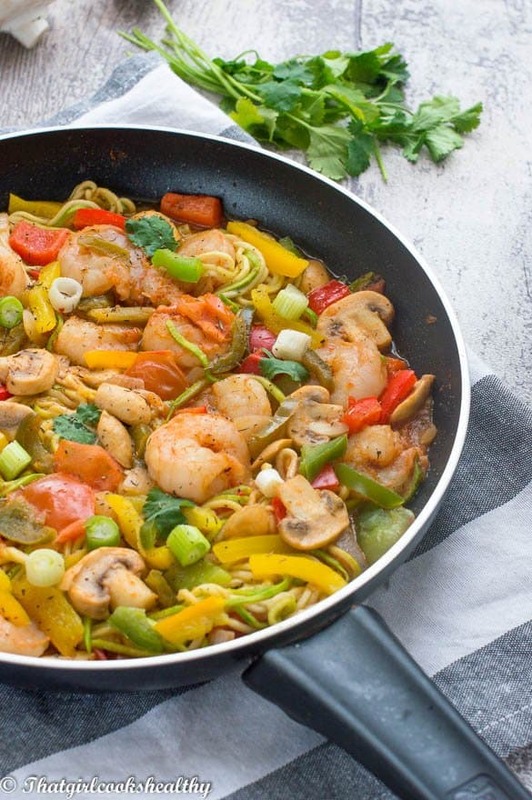 Cajun shrimp zoodles recipe – quick and easy one pan shrimp coated in cajun seasoning served with vegetable noodles, bell peppers, tomato and mushrooms. There are so many delicious tasting cajun and creole recipes out there. I don’t know which one to choose as my favourite. 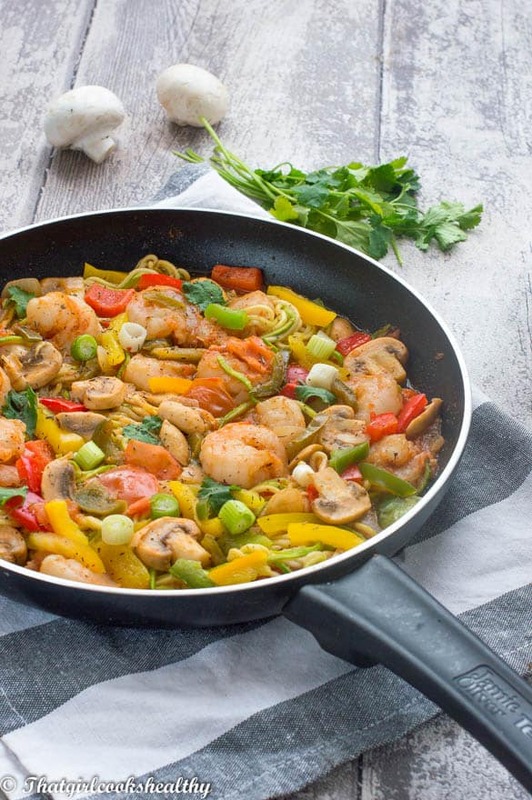 Here in the UK, cajun food isn’t as popular as other cuisines such as Indian, Chinese, Italian. If you want Louisiana Cajun cuisine at a restaurant, you’ll be hard pressed to find any. That isn’t to say southern food isn’t available, just there isn’t a demand for it. As a consequence, it’s somewhat of a rare entity. My first taste of Louisiana was in the states, Florida to be precise. Although Florida isn’t the home of cajun food, the restaurant I went to was owned by a family from New Orleans. I had some grits, shrimp and jambalaya from what I can remember. The food was great, generously seasoning and akin to my Caribbean heritage. 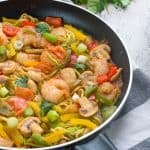 I love seafood with a passion and always wanted try my hand at cajun shrimp zoodles. In case you’re new to my blog zoodles are a low fat/carb vegetable noodles. 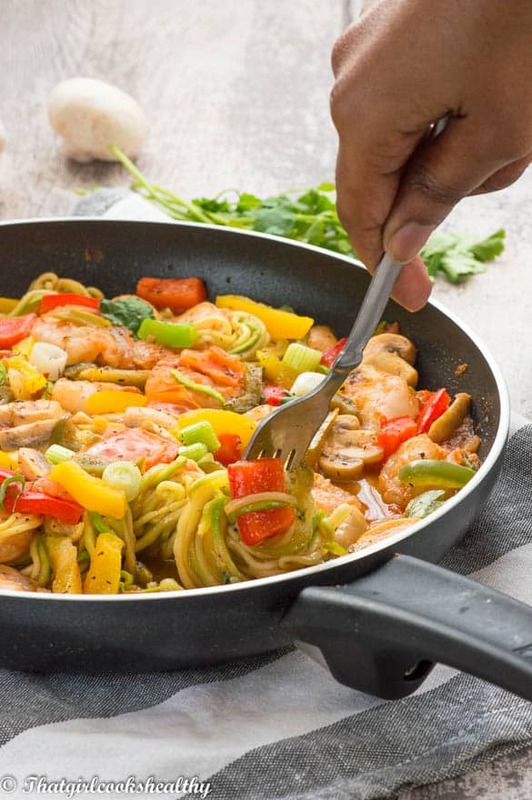 Zoodles are made by using a spiraliser to turn a zucchini (courgette) into noodles. It’s a great concept for eating noodles in a healthy manner and definitely my favourite grain free method. If you loved the aforementioned recipe then you will love this one even more. I followed the same cooking method as what I did with that recipe with a few adjustments. I do recall a few comments from readers stating that the seasoning was very spicy. I feel that spiciness is a matter of discretion, if you don’t like heat then I would suggest omitting the cayenne pepper and/or chilli flakes. I applied approximately a tablespoon of the dry rub to 400g of raw devained shrimp. I also sprinkled about 1 tsp worth of leftover seasoning onto the vegetables while they sauteed in the pan. I did this just to ensure the seasoning coated all of the ingredients. The zoodles do need to be sprinkled with a teaspoon of pink salt and left to sweat in a colander. This an important step that should not be skipped or else the zoodles will have a bitter after taste. Trust me I have had the pleasure of experiencing this first hand. You don’t need to season the shrimp overnight, you can do it ahead of time, on the same day is fine. I will list how to make the cajun seasoning below. I milled my seasoning in a coffee grinder which is optional but preferred. Any leftovers seasoning can be stored in a jar, in cupboard/pantry and re-used. First of all the vegetables will need to be cooked through prior to adding the shrimp. This is done in stages, starting with the onions first, then working your way up to the chunk-ier veg like tomatoes, bell peppers and mushrooms. To enhance the cajun seasoning flavour, be sure to add some of the seasoning to the veggies throughout cooking. The shrimp is added near to the final stages of the dish coming together. 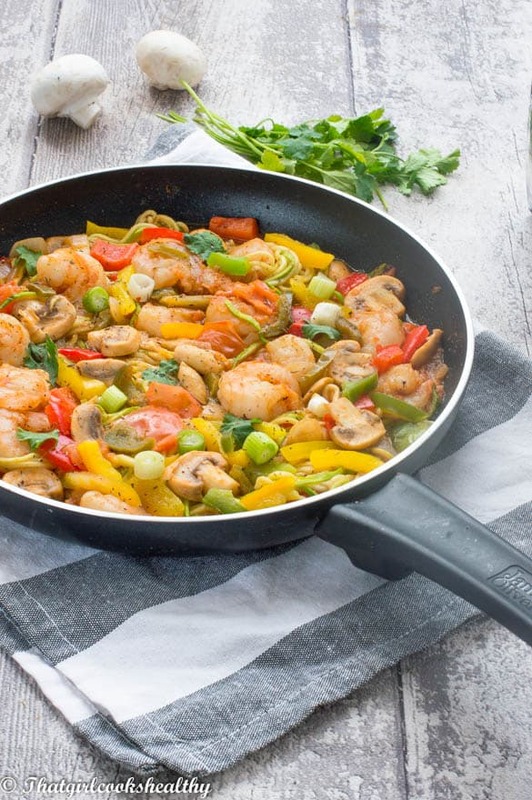 The texture of shrimp is very changeable, it only takes a few minutes of over cooking to learn the hard way, resulting in rubbery shrimp which is unpleasant taste wise. If you are using cooked shrimp them really the goal is to heat them through so 2 minutes prior to removing the pan from the stove is ideal. Simply working the shrimp into the pan so the heat is evenly distributed to each shrimp. Place the shrimp in a bowl and massage the dry rub into the shrimp. Set aside and leave to marinate until ready to cook. 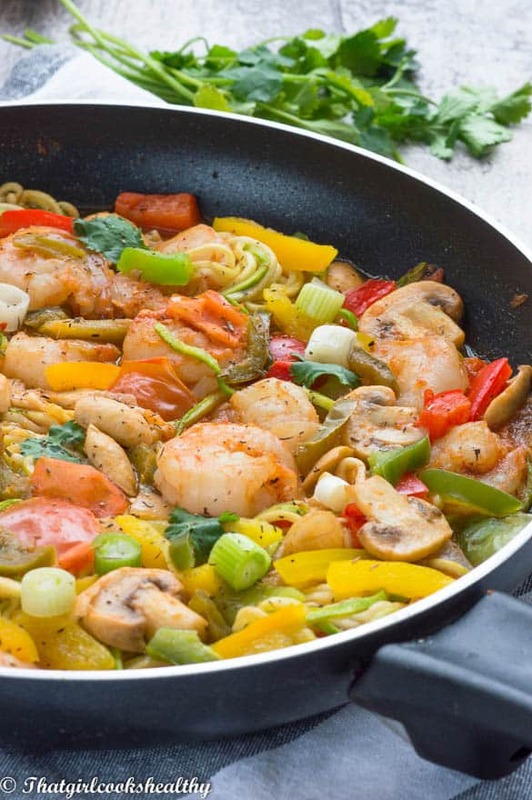 Melt the coconut oil in a medium sized heavy duty frying pan or skillet and begin to sautee the onions and bell peppers on low-medium heat until the peppers are slightly soft. This should take 5-7 minutes. Feel free to put the lid on the pan during sauteeing. Once the peppers soften, at this stage add the mushrooms, tomato quarters and proceed to stir frequently for 2 minutes. Sprinkle 1 tsp Cajun seasoning onto the veggies and add 2 tbsp of water so that the juices from the tomatoes creates a light sauce. After roughly one minute as the shrimp begins to turn from grey to slightly pink, add the zoodles. Stir them so that the shrimp and veggies are combined with the zoodles and heat through for 3-4 minutes. Remove pan from stove and serve accordingly.